Could This Be the Next Cabinet Member Booted? 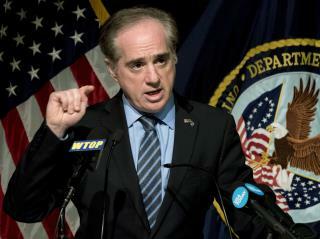 (Newser) – Reports were out over the weekend that Veterans Affairs secretary David Shulkin may be the next Cabinet member to get the boot, but White House deputy press secretary Hogan Gidley downplayed those reports Monday—somewhat. "We all serve at the pleasure of the president. If he is not pleased, you‘ll know it," Gidley said on Fox News, according to Politico. "At this point in time though, he does have confidence in Dr. Shulkin. He is a secretary and he has done some great things at the VA. As you know, the president wants to put the right people in the right place at the right time and that could change." Wow, Trump supporters, It's a little late in the game to continue denying you know what Trump really is. Trump supporters are like the battered woman who just keeps going back to the abusive boyfriend thinking that, in spite of all the abuse, he really does love them and he's going to change. Not gonna happen...EVER. Wow. First it's from 'CNN', wrong incredibly often, basically a rumor mill. Second even if it is true, who cares??? It's a cabinet member. Isn't the Secretary of Energy always a Nuclear Physicist?